Forty-five states and the District of Columbia added construction jobs between September 2017 and September 2018, while 29 states and D.C. added construction jobs between August and September, according to an analysis by the Associated General Contractors of America of Labor Department data released Oct. 19. Association officials noted that the continued job gains were a sign of an exceptional business environment, but that difficulty in hiring qualified craft workers could increase contractors' costs and extend construction times. Florida added the most construction jobs during the past year (70,700 jobs, 14.8 percent). Other states adding a large number of new construction jobs for the past 12 months include Texas (60,200 jobs, 8.5 percent), California (32,900 jobs, 4.0 percent), Georgia (22,300 jobs, 12.2 percent), Arizona (16,000 jobs, 10.8 percent) and New York (11,700 jobs, 3.0 percent). Florida added the highest percentage of new construction jobs during the past year (14.8 percent, 70,700 jobs), followed by Georgia, Arizona, Nevada (10.0 percent, 8,400 jobs), New Hampshire (9.7 percent, 2,600 jobs) and Oregon (9.3 percent, 9,200 jobs). Construction employment reached a record high in five states: Colorado, Massachusetts, New York, Oregon and Texas. Only three states shed construction jobs between September 2017 and 2018, while construction employment was unchanged in Missouri and Maryland. The largest declines and steepest percentage losses occurred in New Jersey (minus 6,100 jobs, minus 6.1 percent), followed by Kentucky (minus 900 jobs, minus 1.2 percent) and Missouri (minus 200 jobs, minus 0.5 percent). Pennsylvania had the largest one-month job gain (3,700 jobs, 1.5 percent) among the 30 locations that added construction jobs between August and September, followed by Texas (3,000 jobs, 0.4 percent) and Georgia (2,900 jobs, 1.5 percent). Kentucky added the highest percentage of construction jobs for the month (2.2 percent, 1,700 jobs), followed by Oklahoma (1.6 percent, 1,200 jobs) and Connecticut (1.6 percent, 1,000 jobs). From August to September, construction employment declined in 17 states and was unchanged in North Dakota, Iowa, Louisiana and Alaska. Michigan lost the most construction jobs (minus 2,100, minus 1.2 percent), followed by California (minus 2,000 jobs, minus 0.2 percent) and New Jersey (minus 1,500 jobs, minus 1.0 percent). 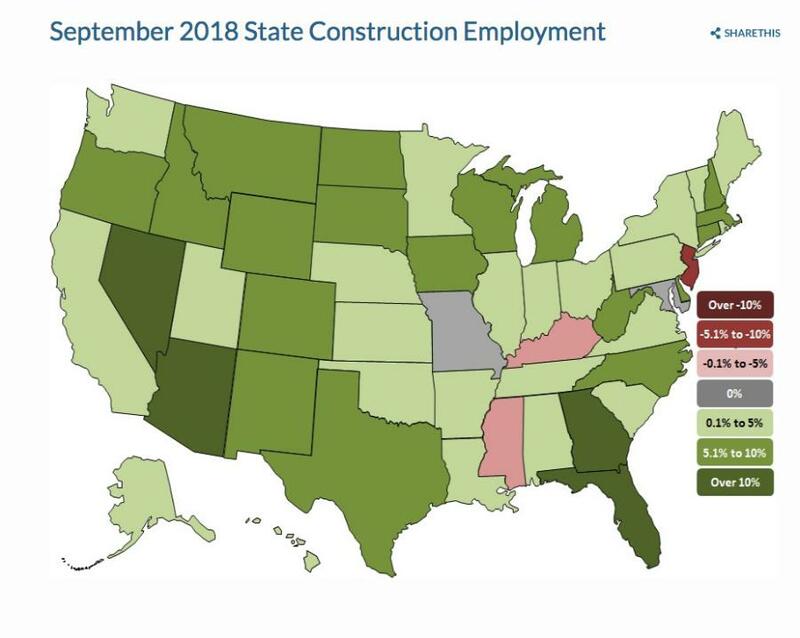 Kansas lost the highest percentage of construction jobs in September (minus 2.3 percent, minus 1,400 jobs), followed by Michigan, Mississippi (minus 1.1 percent, minus 500 jobs) and New Jersey. In a survey the association released in August, 80 percent of construction firms were having trouble hiring hourly craftsmen and 81 percent expected that hiring would remain difficult or become harder. In response, the association has called for public officials to implement immigration reform and double federal funding for career and technical education programs to make more students aware of career opportunities in construction.